Light: Making the best of a bad situation. Recovering from defeat. Resetting expectations. Making allowances for unexpected circumstances. Helping others who find themselves in dire circumstances. Changing the way you see the world. Broadening your perspective through study or travel. Shadow: Refusing to accept that things have changed. Playing the victim. Rejecting the idea that your actions have consequences. Applying scientific criteria to matters of faith, or confusing faith with science. Believing the whole world should be like your small corner of it. Story: The Main Character comes up with a creative solution to handle an unforeseen complication. Relationships. Relationships involve give and take. Prepare for some compromises. Someone may have to adjust expectations in order to be happy. Look around; you may find better options elsewhere. How long since you sat down and discussed what works and what doesn’t? Work. Times change, and the wise businessperson changes with them. Reinvent yourself and your approach to work. Seeking inspiration, go places you don’t normally go. Find out what’s on the “cutting edge.” Now is a good time for business trips, seminars, and training sessions. Spirituality. Attend a workshop or seminar and learn new spiritual techniques. Consider taking a trip exclusively for the purpose of enhancing your spiritual perspective. If a discipline isn’t helping you, abandon it, but not without defining what worked, what didn’t work, and why. Personal Growth. Reaching out to others in need will rapidly advance your growth and maturity. Don’t make the mistake of thinking everyone wants what you want; ask people what they need, and find a way to supply it without strings attached. Know why you do what you do. Fortune Telling. You’ll soon go on a long journey over water. Actions have unexpected consequences, so be prepared. When? Between January 30th and February 8th. The Boatman. 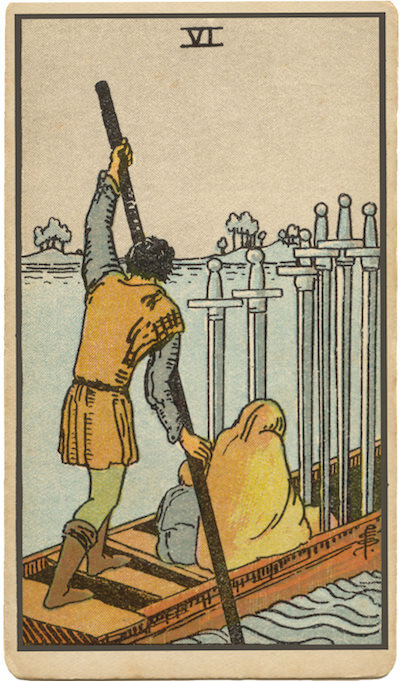 On RWS versions of this card, a boatman steers a craft bearing one or two huddled figures. Lending aid to others in need encourages personal growth. In your situation, who needs help? To what extent are you positioned to supply that help? Swords in the Boat. Many decks depict six Swords embedded in the deck of the boat. Do they form a defensive barrier? Are they needed in case of attack? Or are they products, being ferried to market? What might your answer suggest about your perspective? Ways of Knowing. Extended analysis or going with your gut: either approach can foster greater understanding. Which is your default? What might happen if you tried the other approach now? The Marseilles Image. Six curved blades form a tight lattice. This careful placement would require a great deal of collaboration to construct; once complete, it creates, once again, a space for growth. How might thoughtful collaboration impact your situation today? What assumptions govern my thinking? How willing am I to lend aid to others? To request it when I need it? How prepared am I to deal with change? With unexpected outcomes?